Ryanair is cutting some of its operations at Edinburgh Airport. It will close 8 routes and 60 weekly flights from October 2012. Winter routes affected include Bratislava, Bremen, Frankfurt, Fuerteventura, Gothenburg, Kaunas, Lodz and Poznan. In February, Ryanair cut five routes from its summer schedule, after a breakdown in talks with BAA over airport charges – which it wants lowered. Ryanair claimed the latest cuts would see Edinburgh Airport traffic fall by 500,000 passengers a year and lead to the loss of up to 500 “on-site” jobs. Ryanair says APD is causing it to cut flights from Liverpool to Milan, Rome and Rimini, all in Italy, throughout summer, and Almeria – and cut the frequency of others. Strange that a £13 tax has that effect, when Ryanair happily adds so many other charges, such as €20 per kilo of extra luggage, and €60 for not checking in online. Ryanair has announced further cuts in its operations at Edinburgh Airport. The budget airline said it would close eight routes and 60 weekly flights from October 2012. Winter routes affected include Bratislava, Bremen, Frankfurt, Fuerteventura, Gothenburg, Kaunas, Lodz and Poznan. In February, Ryanair cut five routes from its summer schedule, after a breakdown in talks with operator BAA over airport charges. The airline claimed the latest cuts would see Edinburgh Airport traffic fall by 500,000 passengers a year and lead to the loss of up to 500 “on-site” jobs. Ryanair warned that deeper cuts to its winter schedule “may be inevitable” if BAA Edinburgh failed to agree an extension to a five-year base agreement, which expires in October 2012, on more competitive terms. 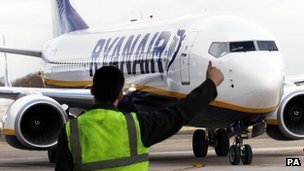 Deputy chief executive Michael Cawley said: “Ryanair regrets BAA Edinburgh Airport’s rejection of our proposals for a competitive cost base which would allow Ryanair to further grow our traffic and routes for winter 2012 and beyond. Mr Cawley said that Ryanair remained committed to Edinburgh Airport, with 1.3m passengers and 17 routes planned for next winter. But he added that “the BAA Edinburgh monopoly cannot continue to ignore the competitive marketplace, where airports all over the UK and Europe have been reducing costs and lowering charges in return for traffic growth”. Mr Cawley said he hoped there was a way to reverse the airline’s cuts “to ensure further Ryanair growth” at Edinburgh. Edinburgh Airport managing director Jim O’Sullivan said: “Of course we are disappointed that Ryanair has announced that it will reduce its services from Edinburgh. “It was expected as we saw similar cuts in last year’s winter schedule. “The numbers quoted on any passenger and job impacts are speculative and we look forward to further negotiations with Ryanair once the sale of the airport is concluded. Transport Minister Keith Brown said: “We are disappointed by the announcement that Ryanair is cutting further services from Edinburgh Airport and, while there are obvious differences, we note that there remains a willingness from the airport and the airline to continue discussions. BAA is selling Edinburgh Airport following a decision by the Competition Commission, with final bids due to be lodged later this month. BOSSES at budget airline Ryanair today blamed UK taxes for a shock decision to axe scores of flights from Liverpool’s John Lennon airport to destinations in Europe. The airline insisted the increase in Air Passenger Duty (APD) was the main reason for the cuts, while industry observers also pointed to recent sharp increases in the cost of aviation fuel. The low-cost carrier has decided to axe flights to Milan, Rome and Rimini, all in Italy, throughout summer. Pisa is now the only Italian city served by Ryanair flights to Liverpool. Flights to Almeria, in Spain, were also chopped and the frequency of flights on other routes pared back. Passengers who had already booked seats on fights which have been cancelled are being offered the choice of a full refund or a free switch to an alternative route. Ryanair spokesman Stephen McNamara said: “As the UK government has increased APD, yet again we were forced to close Liverpool routes to and from Almeria, Milan, Rimini and Rome from April and reduce frequencies on a number of other routes. How to Ryanair charges compare to APD ? Ryanair’s complaints about the impact of Air Passenger Duty on passengers (APD is £13 per passenger for a return flight to a European destination) compared to other charges that Ryanair imposes. Like all budget airlines, Ryanair keeps costs down by charging you for extra services. But no airline piles on the extras like Ryanair. How does Ryanair compare to easyJet? Throughout this article, I have added the easyJet equivalents so you can see for yourself the difference between the two airlines. The Ryanair fee that the most people fall foul of. Everyone who flies with Ryanair has to check in online. That’s right: everyone. You. Must. Check. In. Online. Lots of people forget and are forced to pay a ‘boarding pass reprint fee’. Oh yeah, did I tell you? Check in online! Part of the page is missing. You must print everything, including the advertisement. Note that Ryanair has started putting an advertisement pop-up over your ticket when you first view it online. You must exit this before you print. 60€ per person (from 2012). Ryanair’s highest fee, so worth drawing a lot of attention to. If you misspell your name by one letter, or even if you write ‘Rob’ when your passport says ‘Robert’, you’ll be charged when you reach the airport. 160€ per person if paying at the airport. If you notice before you get to the airport that your name is entered wrong, the charge is ‘only’ 110€. All airlines charge for excess luggage, but Ryanair has the lowest baggage allowance in Europe (15kg) and the highest excess luggage fee too. 20€ per kilo. This means that a 23kg bag that British Airways would allow will cost you 160€ to check in, and a 20kg case that easyJet would allow will cost you 100€. Ryanair is almost unique in allowing hand baggage of just 55cmx40cmx20cm (the vast majorit of airlines allow 56cmx45cmx25cm). So if you take your usual hand luggage bag, Ryanair may force you to check it into the hold. Furthermore, at many airports, if you buy from the airport shops before boarding, Ryanair will charge you if it doesn’t fit in your single piece of hand luggage. See some surprising photos that show how anyone could get caught out by Ryanair: How Strict is Ryanair’s Hand Baggage Allowance? If you’ve already reached your checked-baggage allowance of 15kg and are forced to check in your 10kg hand luggage, you’ll have to pay 200€ to do so (20€ per kg). At the time of writing, Ryanair has 36 checked baggage fees (you can see them all here:Official Ryanair Charges Table). From 15€ to 150€, depending on too many factors to mention. Many budget airlines charge for the use of a credit card, but only Ryanair charges per person, per flight. Ryanair’s credit card fee is 5€ per person per flight. This means a family-of-six on a return flight will pay a collosal 60€ just in credit card fees. The only way to avoid this is to obtain a Ryanair-branded Prepaid Mastercard (a new policy as of November 2011). Visa Electron Cards used to get around this fee, until Ryanair changed to Prepaid Mastercards in late 2009 and then to their own card in 2011. How long will the latest measure last? “Would you like to be one of the first passengers to board to the aircraft?” Ryanair asks when you book your flight. Unfortunately, Ryanair does not actually always offer this service, even when you’ve paid for it. Find out in what circumstances Ryanair fails to provide this service here: Ryanair’s Priority Boarding Fee. In an email to me, Ryanair’s head of communications, Stephen McNamara, described this breach of contract as ‘a trivial, non-issue’. Just 5€ per person. But it’s the principle, right? Ryanair’s travel insurance is a lot more expensive than that offered by most insurance companies, while its cover is considerably less comprehensive. Which?, a British consumer rights publication and website, has a page on Suggested Minimum Travel Insurance Requirements. Ryanair’s insurance falls well short of this. For example, Ryanair’s policy only offers 50,000€ of medical cover; Which? recommends a minimum of two million pounds. Ryanair’s baggage-drop desks are known for their long lines. In an extreme case, Ryanair opened just 11 check-in desks for 255 flights. If you don’t check in in time, you’ll be denied boarding. If you are a non-EU citizen, you also need your boarding card stamped by the Ryanair Visa/Document Check Desk. If you are a UK citizen and you don’t have a passport, you can’t fly with Ryanair, even within the UK. If you can’t board, you’ll pay a 55€ flight change fee and price difference. A recent study found that Ryanair charges most for snacks out of all British and Irish airlines. Can you last a five-hour flight from Edinburgh to Tenerife without refreshments? A bottle of water costs 2.70€ (more than a sweet J20 juice drink). Posted: Saturday, April 14th, 2012. Filed in General News, Recent News.